The small ship, El Populo, like so many other Spanish ships, had a name that seemed to outweigh her size. Officially she was called the Nuestra Senora del Populo. However, she was often referred to as El Pinque, which in English translates to The Pink. Like so many of the Spanish ships that plied the seas, she too was the property of King Philip V of Spain. Travelling with the 1733 Spanish Treasure Fleet, this small, fast ship was the dispatch vessel. In this capacity she would normally travel near the head of the fleet. It was her position in the Flota, and perhaps her smaller size, that explains why she now lies further north of the other ships in the Flota that were lost during the horrific 1733 Florida hurricane. The 1733 Florida hurricane sealed the fate of El Populo along with most of the Spanish Treasure Fleet when they sank or foundered on July 15. One ship survived, and only four other Spanish Treasure ships were salvageable enough to be refloated and then sailed back to Havana, Cuba. When the Florida hurricane began to form, The Pink had been traveling near the head of the Fleet with the regal Capitana El Rubi Segundo. As the storm's intensity grew, Captain Imbernon was able to bring The Pink into shallower water, where he successfully secured her anchor. After the first wave of the storm had passed, the dirty side of the hurricane struck. Now the wind was blowing from a different direction, the boat turned, and her small form smashed onto the sharp coral reefs around her. On this voyage, The Pink was carrying a load of tobacco, exotic woods, citrus, several types of dye, hides and gifts. It didn't take long for the water to enter her hull, flooding her chambers. This soaked the water absorbing tobacco, which added to the crushing weight, escalating her breakup. As the ship was sinking, the crew noticed that the dispatch or advice boat, the Delores, had also foundered nearby. Realizing that her longboat was still intact, the crew made their way over to the "aviso" and the 2 crews made their way to shore. It was here that local Indians shared the dreadful news about numerous vessels foundering along the coastline. The only ship in the Spanish Treasure Fleet to escape unharmed was the El Africa. She had been at the head of the Fleet, and Captain Huboni had been able to anchor his ship in much deeper water. Successfully riding out the storm, Captain Huboni set sail and was able to locate the wrecked and abandoned Delores. Noticing people ashore, he sent his longboat to investigate and brought back the crew from El Populo and Delores. From here he made his way back to Havana, Cuba and then notified Spain of her tremendous loss. It was several centuries before anyone found these Florida shipwrecks. However, during the salvage frenzy of 1950 to 1965, scuba divers began to arrive in droves. Their mission was to dive Florida Keys waters in search of Spanish coins and sunken treasure. The small El Populo went unnoticed as it was mostly buried beneath the sand. However, in September, 1966, three divers accidentally discovered her cannon lying in the sand on a pile of ballast. Keeping their find quiet, they secretly returned to her over the course of a year in their hunt for treasure coins and valuable artifacts. They were able to successfully uncover several Spanish relics including a bronze mortar canon, a gold ring, a silver and pewter spoon, a porcelain cup, and a silver plate. They recovered a few other interesting pieces, but one find in particular was of tremendous importance. They'd discovered a Spanish coin, but what made it even more exciting was the fact that it was a pillar. Discovering this single Spanish coin was key to confirming that this was indeed a vessel from the 1733 Spanish Treasure Fleet. Today, the remains of this scout ship lie in Biscayne National Park, north of Key Largo FL and John Pennekamp Coral Reef State Park. The Pink rests on a sandy bottom, in clear shallow water, at a maximum depth of 30 feet. 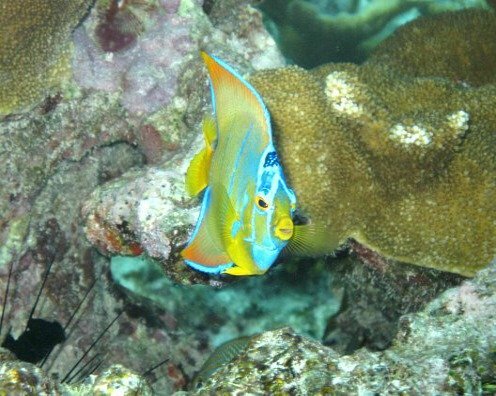 This is without question, the perfect diving or Florida snorkeling spot for anyone wanting to venture out a bit further when diving Key Largo. 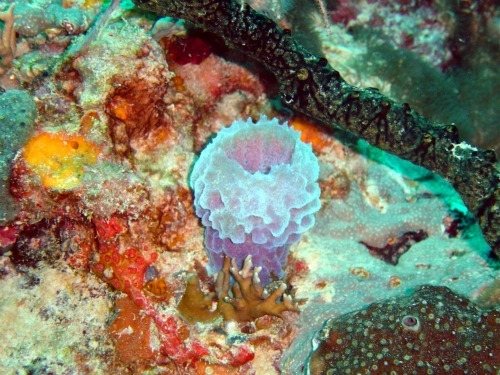 The Pink also lies in the protected area of Biscayne National Park which has made it possible for the coral and other marine life to have substantially flourished. Wreck diving this site you'll be treated to an amazing display of different species of stony and gorgonian coral including sheet, star, brain, sea whips, sea fans, plus a variety of ocean sponges. The schools of various tropical fish are bright and colorful, and juvenile game fish hang out along the coral reefs and in the grasses surrounding the last, few remains of El Populo. The finding of the El Populo was significant even though she did not carry a cargo of Spanish treasure. You will however find that wreck diving her remains will likely be as thrilling as it was for those who discovered her. If you're scuba diving Florida Keys and choose to explore her final resting place, take the time to visualize her once fast, sleek form. Imagine the era of aristocracy and tremendous Spanish might that prevailed during that period. Then look past her still form at the extensive marine life that have carved out a home around her bones, and enjoy another splendid day Florida diving and snorkeling.